Can Tiny Houses Be Parked In RV Parks? A big problem travel tiny houses have is finding the right place to park. Families who seek adventure in RVs seem to always have the same problem. But, the difference between traveling in an RV and a tiny house is that there are RV parks. Can tiny houses be parked in RV parks? Yes, tiny houses can park in RV parks, but there will be restrictions. Each park has its own set of restrictions because most RV parks are privately owned and operated. Make sure to check the softness of the ground to make sure your tiny house will not get stuck. Here is everything you need to know about using RV parks with your tiny houses. What Conveniences Do RV Parks Offer? How Much Does It Cost To Use An Rv Park? The great part about having a mobile tiny house is that you don’t have to be limited to one adventure. Why look at the same sunset each night when you can be experiencing thousands of new sunsets? 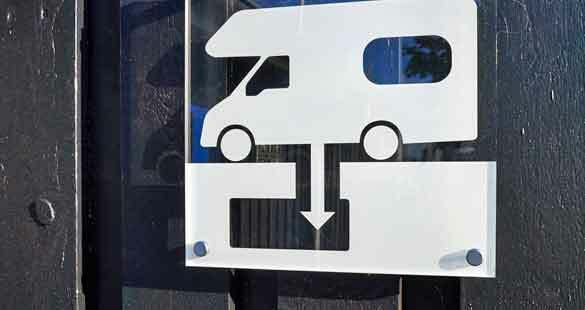 RV Parks have designated parking stations for most mobile homes. These are often short-term parking options for people who like to live life on the road. Along with road enthusiasts, RV parks are meant to be vacation spots as well. The reason why people like to use RV parks is that they are built in with utilities they need. RV parks are much more than a place to rest your wheels for the nights. Most RV parks also offer spaces for pop-up campers as well as tent campers. This means that RV parks are the perfect destination for any style of camper. But, are they good for tiny houses? While tiny houses can often be parked in RV parks, most owners prefer to park in them either overnight or for short-term stays. One of the biggest perks about using an RV park for your tiny house is that you are open to all the amenities. On-site laundry is a great feature when you live life on the road. Most RVs and pop-up campers don’t have their own laundry system. Being able to run laundry is an important part of travel. Clothes and linens pile up quickly and with tiny houses, clutter is the worst. This is because space is already limited enough. However, many tiny houses are not like RVs or campers. Many tiny houses already have their own system for doing laundry. So, having on-site laundry at an RV park may not be a perk. But, when you consider that most laundry machines in tiny houses are compact, there is an appeal to a laundromat. Spending the night in an RV park is the perfect chance to deep clean heavy bedding that may not fit in your own machine. One thing that can be lacking while living on the road is a sense of community. While thinking large like the whole world is your community is nice, it isn’t always ideal. RV parks have a great sense of community. This is not only for adults but for children as well. Most RV parks feature some sort of recreational activity. From basketball courts to horseshoe competition, there is a real sense of community. This allows everyone to blow off some steam from long days on the road. The fun doesn’t end with the children either! Nighttimes around the fire with a bottle of wine and some new found friends is a great way to feel like you’re a part of something. Some of the best RV parks are located right in the heart of nature. They have found a great way to combine the beauty around you with a great nights sleep. Finding RV parks that are more than just a place to park can be part of your adventure. These types of RV parks have nature trails and look out spots that are the perfect backdrop to any vacation. This is especially true if the park is near water. Having either a river trail for fishing or a lake for swimming is a great way to break up the day. These parks can be scheduled into to your travel so the fun never has to stop! One thing that can be lacking on the road is a connection to the internet. While RVs don’t come standard with a hot spot, this isn’t always a problem for tiny houses. Many tiny houses are right at the peak of technology. Most feature their own personal hot spot. If your tiny home is a true simplest that doesn’t have WiFi, RV parks may be perfect for you. Many RV parks now offer some form of WiFi throughout, but you will have to pay for it. On the other side of the coin is power. RV parks are a great place to hook RVs up to their power source. They offer power up to 50 amps. However, many tiny houses run on their own fuel power source. One thing that both RV owners and owners of tiny homes need to do is take care of waste. While tiny houses do use their own plumbing system, the tank will still need to be flushed. This is especially true for tiny houses that are meant to travel. Finding dump stations can sometimes feel like a chore. However, some RV parks feature their own sewer system which can make flushing the system easier. All though this is an extra service that you may have to pay for, it’s totally worth it. To find out more about dump stations and how they work, check out this article about how dump stations work! One benefit about finding your own places to park is that you can save money. But, using an RV park will cost you some chunk of change. If you are still looking to save some money on your trip, consider only using RV parks once and a while. This way you can get the best of both worlds. You can continue to explore without limits while still having a place to regroup at the end of the week. On average, most RV parks cost upwards of 50 dollars a night. However, if you know you will be using RV parks frequently, you have options. Many RV parks offer memberships to frequent users. This means you will only have to pay a once a month fee. This price is on average around $900 a month. While the monthly memberships make sense for people traveling in RVs, it isn’t always the best option for tiny houses. This is because many of the amenities that RV parks offer can already be found in tiny houses. To save money and keep from overspending, stick with a nightly rate. This is only if you know you will be using an RV park less than 10 times a month. Living in a tiny house really does mean that you have freedom and control. You have the freedom of letting the world be your backyard and the control of where to sleep. Using helpful road conveniences like RV parks is a great asset to tiny house living. However, the most important thing to remember is that each RV park is different. Some may not allow tiny homes. This is why it is so important to plan ahead. The last thing you would want it to travel to your ideal RV park to find that you can’t park there. Quick research into the specific RV park and their restrictions ahead of time will save you the heartache. A great thing about RV parks is that it is fairly easy to connect your tiny houses. The more prepared you are before hitting the road, the better shape you will be in.